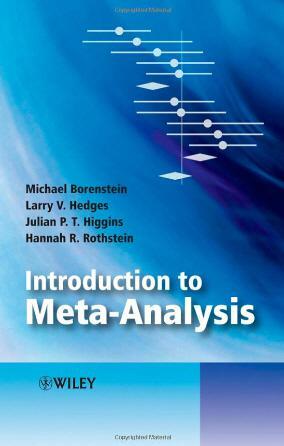 This book provides a very clear overview of meta-analysis – what it is, why we use it, how to perform and interpret a meta-analysis, and how to avoid common mistakes. It starts with basic ideas (how to compute an effect size and perform a simple analysis) but then moves on to more advanced issues (subgroups analysis, meta-regression, multiple outcomes, publication bias). While the book’s approach is primarily conceptual, it includes formulas and worked examples that serve both to illustrate the concepts and to provide practical advice. The worked can be accessed here, both as Excel files and as CMA files. This book has been widely adopted as a text for meta-analysis courses, and has consistently been a best-seller on Amazon since its release. This book is a classic. 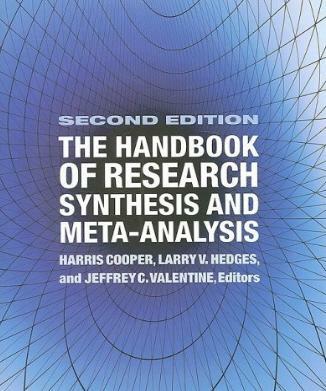 Recognized as the definitive resource for research synthesis when published in 1994, this book was updated in 2010 and remains the first book many people turn to. The book is arranged as an encyclopedia, with each chapter written by experts in a specific aspect of research synthesis. However, the editors also arranged for the chapter authors to use the same datasets and style throughout, so the book flows naturally from one section to the next, and offers an excellent overview of the field for statisticians and researchers alike. This book is the essential manual for all those preparing, maintaining and reading Cochrane reviews. The first part provides an introduction to The Cochrane Collaboration and Cochrane reviews. The second part lays out the core methodology for Cochrane reviews, from question formulation through study selection, data collection and assessment of bias to meta-analysis and interpretation. The third and final part addresses special issues such as including non-randomized studies, adverse effects and economics issues. 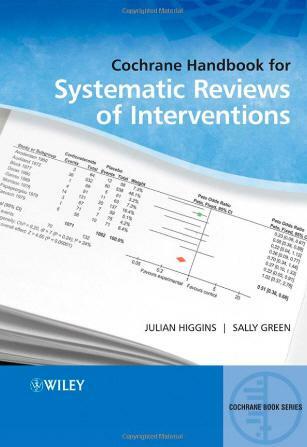 Most of the principles and methods described in the book are appropriate for systematic reviews applied to other types of research and to systematic reviews of interventions undertaken by others. 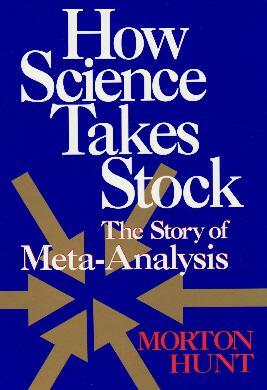 Like “The Handbook”, this book, published in 1985, helped to open the field of meta-analysis to a generation of researchers, became an instant classic, and remains a valuable resource to this day. Where "The Handbook" covers many aspects of research synthesis, this volume focuses almost exclusively on meta-analysis (the statistical component of research synthesis), and does so from a mathematical perspective. This book focuses on that part of the research synthesis that is not the meta-analysis: How to formulate the research question, locate the relevant studies, code the data, interpret and present the analysis. 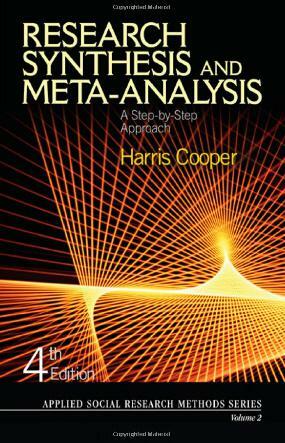 This book puts the meta-analysis endeavor in context, and is an invaluable (and very readable) resource, both for researchers and as a text in courses on meta-analysis. The book’s approach is captured in its title. 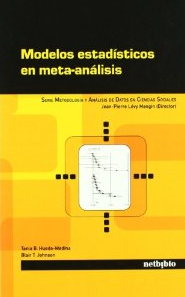 The book offers a practical, hands-on approach and as such is probably the best general purpose introduction to meta-analysis. 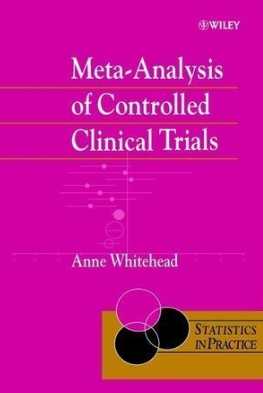 It offers an overview of all aspects of research synthesis, and a non-technical introduction to the statistical aspects of meta-analysis. 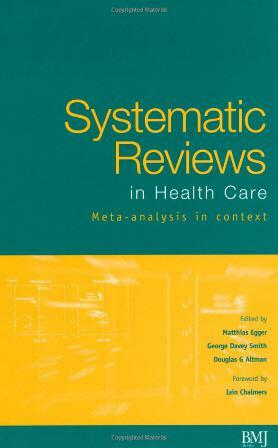 This book can serve as a text for short courses in meta-analysis. This edited volume does for systematic review in medicine what "The Handbook of Research Synthesis" does for research synthesis (primarily) in the social sciences. It provides an overview of the field and then explores specific issues in detail. These include statistical issues, but also such issues as standards of evidence, the use of observational studies in meta-analysis, practical implications of heterogeneity, and so on. While this volume is geared primarily toward researchers in the medical fields, the issues raised are relevant also to the social sciences and other fields. Like “Systematic Reviews in Health Care”, this book draws examples primarily from medicine and epidemiology, but the focus here is more on statistical issues and less on the broader framework of systematic reviews. There is surprisingly little overlap between the two books. Many of the topics covered in either book are not covered in the other and when the two books do address the same issue, each tends to provide a somewhat different perspective. The style is clear and relatively non-technical, and the examples are used effectively. As was true of “Systematic Reviews”, the issues covered in this book are relevant also in fields other than medicine, and anyone engaged in meta-analysis or research synthesis will find this to be a valuable resource as well as an excellent read. Meta-Analysis provides a mathematically accurate synthesis of the available data, but cannot guarantee that the available data is unbiased. In fact, it has been shown that researchers are more likely to publish studies that yield relatively large treatment effects than studies which yield more modest effects, which raises the concern that any synthesis of published data can yield an exaggerated effect. 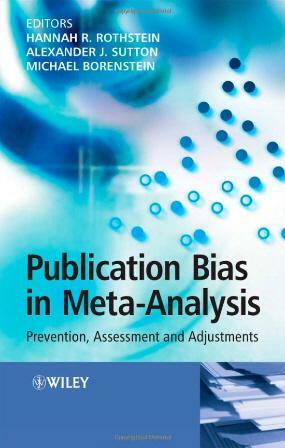 This book traces the history of the problem, explains how to assess the potential impact of bias in any given meta-analysis, and discusses mechanisms that are being adopted in hopes of minimizing the potential for bias in the future. 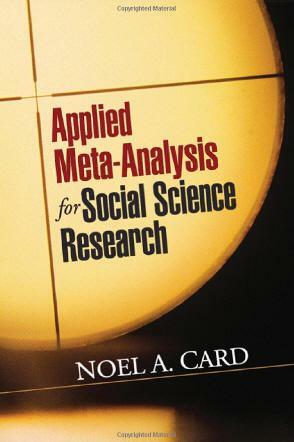 This book discusses the history of meta-analysis over the past several decades – how it emerged as a field, what role it has played in medicine and social science, and so on. Mr. Hunt is a journalist, and this book reads like an extended article in the Science section of the New York Times – interesting, very well written, and informative. The book provides a glimpse at some of the people responsible for the development of this field, some of controversies that have developed around it (“Apples and Oranges”, “Garbage in, Garbage out"), and how meta-analysis is likely to affect the practice of research and policy in the future. This book focuses on the Hunter-Schmidt approach to meta-analysis, and as such it differs from the other books on this page in three ways. It focuses primarily on validity coefficients and standardized mean differences, to the exclusion of other effects size indices. It focuses on artifact corrections, that is, adjusting the point estimates to account for imperfect reliability and range restriction. It weights the studies by sample size, rather than inverse variance. This approach is generally the preferred approach among persons working in Industrial/Organizational psychology, and for these people this book would be the primary resource. 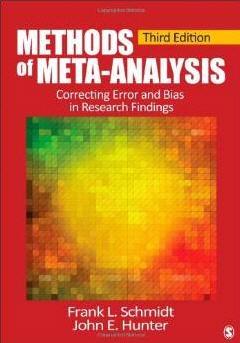 For others, this book offers a look at an alternate approach to meta-analysis. Where the Egger and the Sutton books attempt to look at the big picture of meta-analysis as part of a systematic review, this volume focuses primarily on the mathematics of the meta-analysis itself, starting with simple examples and moving on to advanced issues. In that sense this volume is similar to Hedges and Olkin’s book on statistical methods, but the Whitehead volume has a more limited focus. 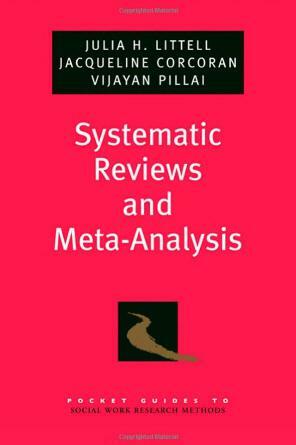 This book provides a highly accessible introduction to the concepts and methods of research synthesis, focusing on systematic reviews and meta-analysis. Examples are drawn from social work, social welfare, psychology, and education. 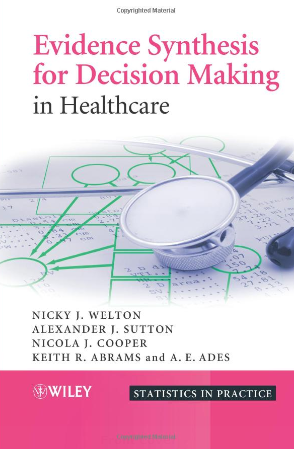 Chapters cover topic formulation and protocol development, locating and screening studies, extracting data and assessing study qualities, effect size metrics and pooling methods, assessing bias and variations in effects, and interpreting results. The book is useful for researchers, practitioners, policy makers, and students. 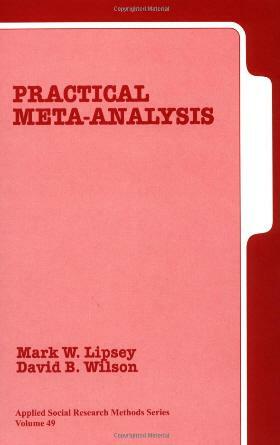 This book offers pragmatic guidance for planning and conducting a meta-analytic review. It is written in a nontechnical style that makes it valuable for graduate students or beginning meta-analysts. 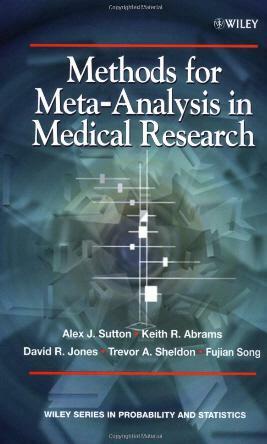 The book describes all steps of a meta-analysis, including identifying research questions, retrieving published and unpublished studies, coding, analysis, and write-up. In addition to these fundamentals, the book introduces more advanced topics, including artifact correction, random and mixed-effects models, structural equation representations, and multivariate procedures. A common example is used throughout the book to illustrate these techniques. The book also contains additional user-friendly features, including thoroughly annotated equations and “practical matters” sections based on the author’s experience in publishing meta-analytic reviews. 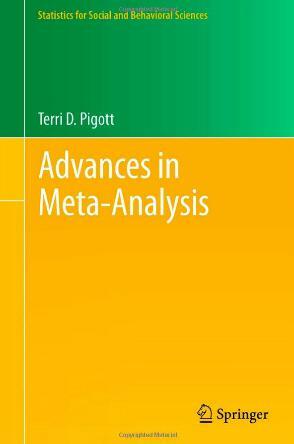 The subject of the book is advanced statistical analyses for quantitative research synthesis (meta-analysis). It also includes selected practical issues relating to research synthesis that are not covered in detail in the many existing introductory books on research synthesis (or meta-analysis). Complex statistical issues are arising more frequently as the primary research that is summarized in quantitative syntheses itself becomes more complex, and as researchers who are conducting meta-analyses become more ambitious in the questions they wish to address. 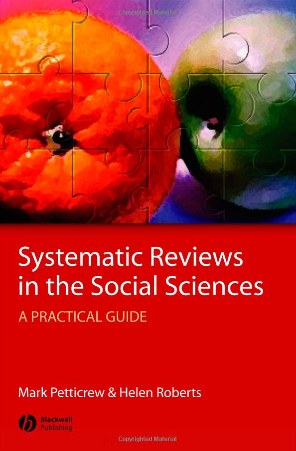 This book, written by two highly-respected social scientists, provides an overview of systematic literature review methods - outlining the rationale and methods of systematic reviews, giving worked examples from social science and other fields, and applying the practice to all social science disciplines. This book intends to be a guide to learn how to obtain a comprehensive average of the magnitude of effect across studies, assessing the consistency of the results distinguishing among the different statistical models that can be used in meta-analysis, fixed-, random- and mixed-effects. 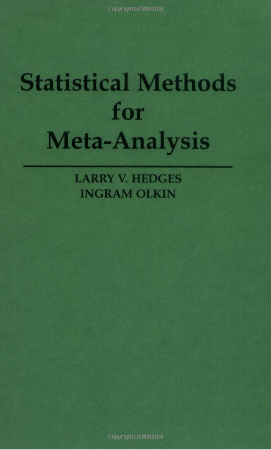 This book is a useful addition to any handbook of meta-analysis for scholars who want to understand and run the three main statistical models that can be applied in meta-analysis. This book is intended to be used in a wide variety of ways. It will serve as an introduction to evidence synthesis, leading from relatively simple to intermediate level examples. Everything is set within a Bayesian framework, and within a decision-making context, and for those unfamiliar with either of these fields this book should provide a useful introduction. At the same time, the book can be simply taken as a treatise on evidence synthesis.